I’ve been super eager to post this DIY tutorial because this beanie has been my winter staple ever since I made it! 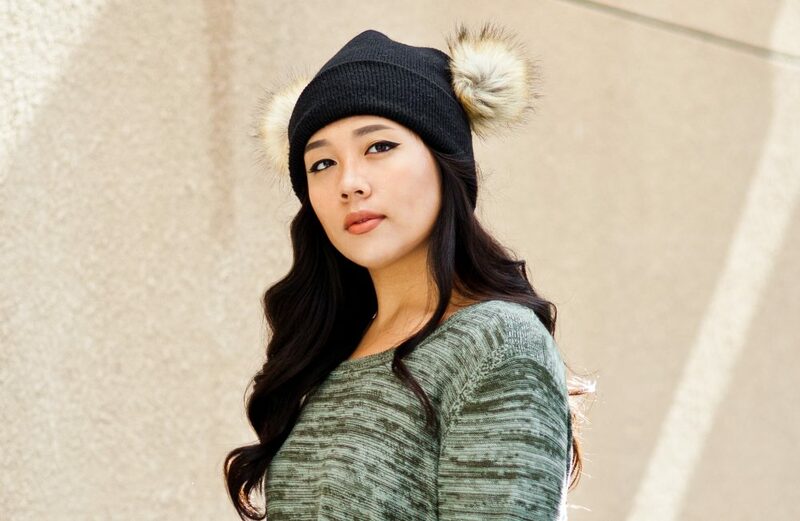 This cute furry ear beanies have been such a huge trend for the season, but tons of them go from $15-$20. 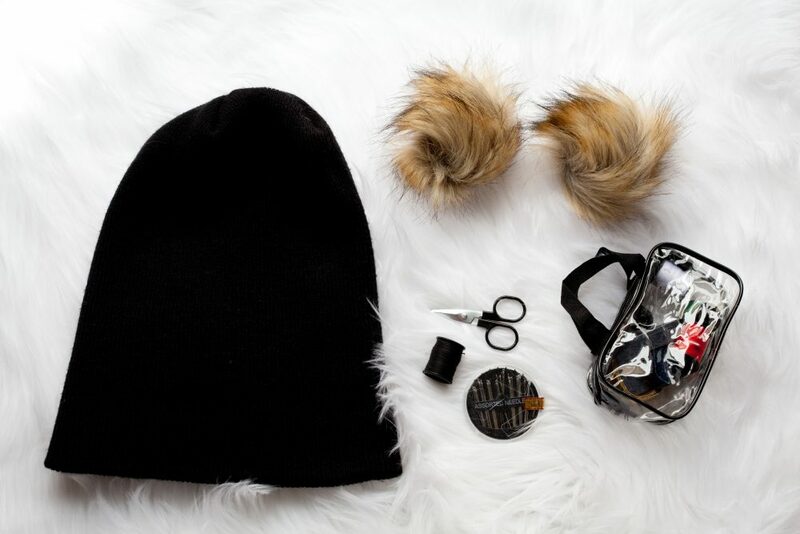 If you have a spare beanie that you want to repurpose or just want to make a customized one for yourself, then this DIY project is the way to go. A beanie – I used a spare black one I had lying around. If you want to get a new one to customize, there are tons of plain beanies on Amazon from anywhere between $5-$10! Matching thread, scissors and a needle. I got my little emergency sewing kit at the Dollar Tree for $1! It may not have the best quality needles but you get a whole case of them along with multiple spools of thread in a carrying case. Win! 2 fur pom-poms. I bought this exact one on Etsy in brown and it’s now sold out, but there are many other pom-poms on Etsy! The ones I have are 10cm, but you can always go bigger – I actually think bigger ones are cuter! Loop the thread into the needle loopy thing. Fold the thread in half so that the needle is at the halfway point of the thread. This doubles-up the thread and assures that it doesn’t break. Tie a knot at the end of the thread about 2 inches from the end. Then tie another knot over it so that the knot is bigger. 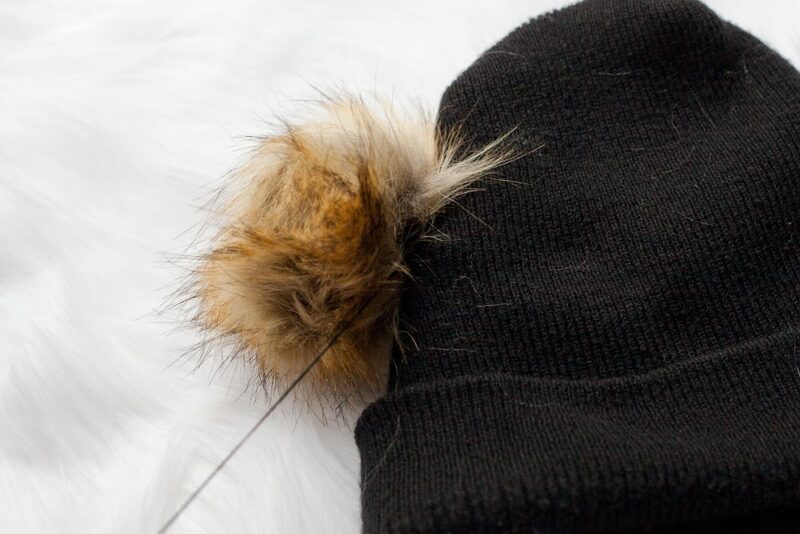 Using the needle, sew into the innermost part of the pom-pom that you will be attaching to the beanie. After you’ve threaded all the way through and are stopped by the knot, then double-tie a knot to hold the thread in place. I thread back in and out of the same spot a few times because I’m paranoid and don’t want my pom-poms to fall off. I’m sure an atelier would frown upon this and come up with a more refined and less cave-man method of doing this. When you’re finished, tie a knot again to secure the thread. Don’t cut the thread yet! All of you seasoned sewing enthusiasts are probably going to throw rotten tomatoes at me. What I did next was put the beanie on my head and used some pins to mark where I wanted the pom-poms to be located. After some trial-and-error, I got both pom-poms at equal level. 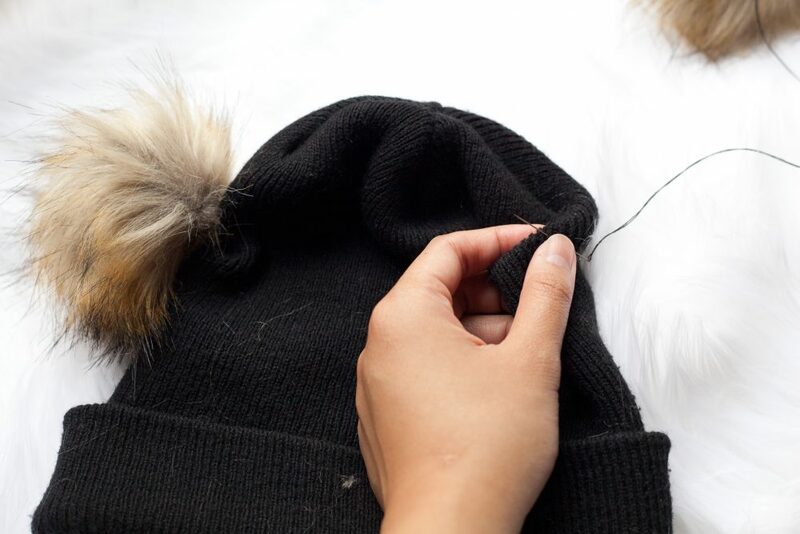 Using the thread that’s attached to the pom-pom, sew directly into the spot on the beanie that you marked. Sew in and out of this point a few times to securely fasten the pom-pom onto the beanie. When done, then tie a knot in the thread and then cut. Repeat everything above for the next side. If you find that your pom-poms are sitting unevenly, you could try using 4 points to sew the pom-pom in like the shape of a square. Instead of sewing it on using one anchor point, four anchor points would make the pom-poms roll around much less and sit firmly in one spot. I strongly recommend trying the beanie on in-between steps to assure that it isn’t slowly turning into a trainwreck. If you have the option for thicker needles and thread, I definitely recommend on investing on quality sewing notions, especially if you intend to DIY in the future. The kit I used from the Dollar Tree worked, but the thread was very thin and the needles felt like they were about to break almost every time. This $1 kit is a steal, but I keep it in my car for emergency sewing instead of daily use. Evergreen Art Supply has a good quality sewing kit for about $14 on Amazon complete with all of the basic necessities. 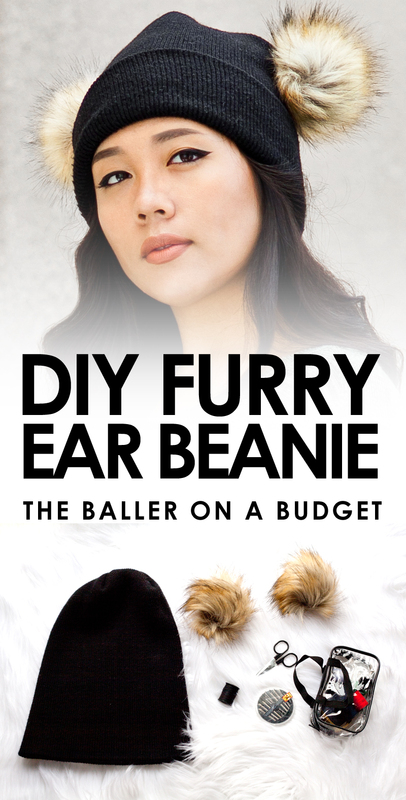 If DIY isn’t your thing, you can always buy a pom-pom ear beanie. I’m quite frugal and didn’t want to waste an unused beanie lying around, but these beanies range anywhere from $15-$20 on Amazon. 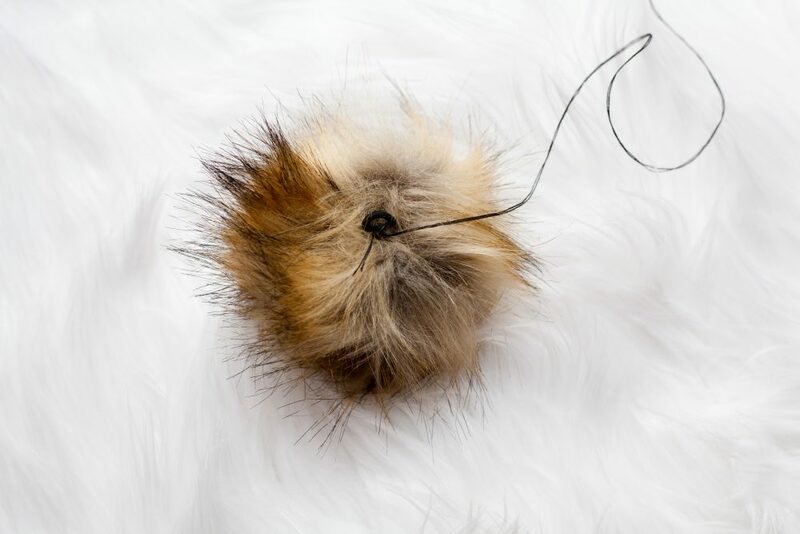 Are you going to try making a furry pom-pom beanie? Let me know in the comments and don’t forget to subscribe to my newsletter below for more DIY projects!